RSS and stock quotes screensaver. Is there a better alternative to Mac3DWatch? Is Mac3DWatch really the best app in Newsreaders category? Will Mac3DWatch work good on macOS 10.13.4? 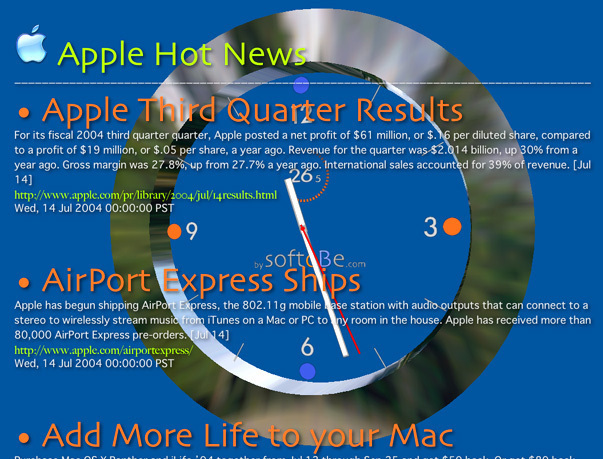 Mac3DWatch is a ScreenSaver for MacOS X 10.3 or higher displaying RSS and Stock quote news feed. It shows a live and spinning 3D metal watch synchronized with your local system watch, plus, optionally (in an overlaid scrolling text) your favourite and customizable RSS and Stock Quote news feeds. You can customize up to 99 RSS news feed with your favourite one. And you can customize up to 99 Stock Quotes channels with your favourite Stock Symbols. Last, you can set up to 99 alarms which will play a sound, songs or an iTunes playlist at a given time. Mac3DWatch is now compliant with MacOS X 10.6 Snow Leopard. Mac3DWatch needs a rating. Be the first to rate this app and get the discussion started!